We decided to fly into Chicago on Friday evening, a few days, before the race to catch the marathon expo and scope out the starting line. 1) There was a Blue line Train station in O’hare airport which goes straight into the city. We recommend buying a multi-day pass, which works on the trains and city bus and it’s the easiest way to get around. 2) If you don’t want to take the train, Uber was 21$ took about 45 minutes (depending on traffic) to get to the hotel. We ended up staying at the DoubleTree by Hilton Hotel Chicago – Magnificent Mile. The hotel was affordable at around 100$ per night, and was less than a mile from the starting line so you could walk if you wanted to. First things first we stopped by the Expo at the McCormick Place for packet pickup and to get some gear. Everything opened at 9am and if you are planning to pick up some Chicago Marathon gear go early because the lines were long and they sold out of things like jackets and visors. Luckily for us Nike had the entire marathon gear lineup online, and we ended up having a jacket shipped to the house. After the expo we headed to the Millennium Park area to scope out the starting line and grab lunch. There were a bunch of trendy spots to choose from, and we picked the Intelligentsia for a chic coffee and a quick bite before exploring. The Washington/Wabash stop and Lake stop were about 2 blocks away from the start of the Marathon and would be the best way to get to the race in the morning. But do as I say not as I do... we ended up taking an Uber to Michigan Street because we were worried about taking public transportation. 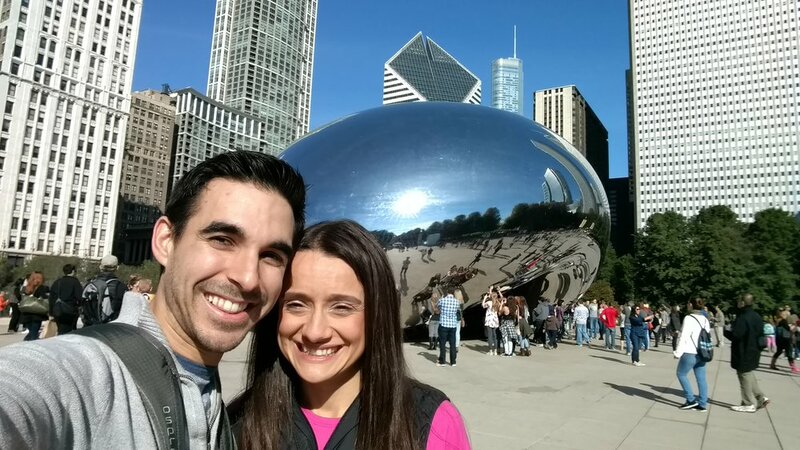 After we figured out our race day plans, we walked through the park to check out the Millennium Monument (the bean) and the Cloud Gate statue. If you have a little extra time The Art Institute of Chicago is worth a visit, but it’s a lot of walking the day before your race. For dinner we took the Blue line train out to the Damen stop to check out the Wicker Park Area. We have a marathon tradition of getting Italian food the night before the race and ended up at Club Lucky. The place had a cool old-school Italian diner feel to it, and they had the food to match. We highly recommend trying the Caramel Ricotta Cheesecake and Tiramisu. Don’t forget to take it easy and rest up for your big day! Keep it lite the morning of your race, Flavia really likes Bananas and I prefer the Stingers which are easier on your stomach. She also brought along (4) 2nd Surge Gels, and a pack of Cliff Blocks Energy Chews for the race. The plan is to take the energy gels every 7 miles, and the blocks for cramping if necessary. 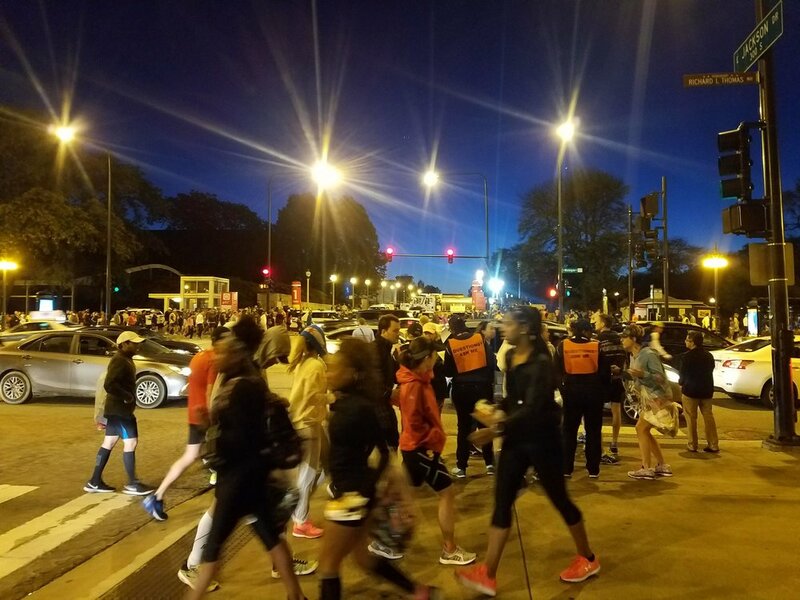 The starting line is on S. Columbus Dr., however everything east of Michigan Ave is blocked on race day to only runners. We were able to get an Uber to Michigan St. from the hotel but it gets crowded between Randolph and Jackson Street (Highlighted with the Green Box on the map). There are a few coffee shops open early in the morning around the start, but if you are looking for a bathroom the lines are really long. From here on Flavia and I said goodbye and she headed to the starting line for the race. If you are a spectator my favorite place to watch the race is on the south side of the S. Columbus Dr. Bridge, where you get a really unique view of the runners coming out of the tunnel. From there you can use the River-walk to catch your runner again on the LaSalle Bridge and Orleans Bridge. If you are feeling really ambitious you can catch the Green line or Red line down to Chinatown before meeting your runner at the finish line. I marked all of the spots I was able to see Flavia on the map above with green circles. After the race we were both exhausted, Flavia a little more than I was, so we headed back to the hotel to rest and get ready for dinner. That evening we headed out to the West Loop area to meet some friends and get dinner with one of our trainees, who also ran the marathon. We ended up eating at Forno Rosso, a small upscale pizza join with classic Neapolitan pizza. Monday morning we headed out to explore the city. We started off with a coffee in the downtown area and then stroll down the River-walk towards the Navy Pier. The River Walk is great with lots of sights to see along the way, but we would suggest not going to Navy Pier during a weekday. Navy Pier looked like a lot of fun on a weekend or in the evening as there were a lot of Bars but everything was closed during the morning when we were there. After visiting the Navy Pier we headed decided to try a famous Chicago Hot Dog and Italian Hot Beef sandwich. A friend had recommended Portillo's, so we headed to the closest one on Ontario St. Portillo’s was amazing and 100% worth the trek to get a hot dog, which was a classic as they come; all beef, on a poppy seed bun, topped with yellow mustard, chopped white onions, sweet relish, dill pickle, tomato slices, and peppers. I would also recommend trying the Hot Beef sandwich but get it “Dipped” in gravy with peppers, cause you just ran a marathon and you deserve it! After experiencing true Chicago culture we headed back uptown to catch an Architecture cruise. We booked a cruise with Shoreline Sightseeing which left port around 4:30 pm. We recommend booking your cruise ahead of time to skip lines, and show up about an hour early so you can get a seat on the top deck of the boat. The tour was guided by local Architecture students and each one puts a different spin on what they point out. We ended up catching the tour right at dusk so by the end of the tour we got some great night views of the city by Navy Pier. When we go back for the next marathon we will be doing this tour again! On our last day in Chicago we decided to be real tourists and check out the Sears tower… you can’t come all the way out to skip this sight right. We just had to have that iconic picture in the Sky Deck to round out the trip. That morning we set out towards the town, and little did we know every other marathon runner and tourist in Chicago was also on their way. When we arrived there was a line out what appeared to be the door but was in reality the line to the next line. It probably took us about an hour to get to the observation deck, but the glass balcony was so packed we decided it wasn’t worth it to try and cram in for a picture. I will admit the views from the tower were breathtaking, but if you are on the fence I would skip this one. After hanging out around town for a little while killing time our final destination was a Chicagoland Speakeasy Tour. The tour covered tour covered 4 speakeasies and plenty of history and drinks were served. After the speakeasy tour we stopped in at the Kingston Mines blues bar for some live music and delicious pub food to finish off the trip. The Kingston has been open since 1968 and is one of the oldest running blues joins in Chicago. If you're a music love this one is a real treat.